As you might know, following our major problems with PayPal during our MacGraPhoto bundle, we switched our payment processor to FastSpring. We considered several options based on the excellent article featuring e-commerce providers’ survey results by Andy Brice. We then went to try FastSpring based on the high scores that they got in the survey and based on the features that they provided at that time. If you’re not familiar with FastSpring, they are a California-based company, relatively young and their website tagline is “The industry’s best customer service”. So let’s start with this aspect. I can’t compare all the companies but FastSpring’s customer service is indeed top notch. Starting from their help to build the web storefront (in fact, they can build it for you based on the design of your site) and continuing with answering any questions, technical or business related, in a timely and personal manner. FastSpring assign an “account manager” to each customer, so you know by name who’ll answer most of your questions. They answer to support emails or inquiries through the website fast and in a personal, transparent manner. They’ll sometimes go much over the required minimum. For example, at one time I asked about A/B testing possibilities and Ken answered deeply not on the technical but also on the business side of A/B testing, advised us to modify store flow and even spotted that we haven’t updated our copyright footer to include year 2010. This kind of attention to customer service is rare these days. Now, let’s see what’s in the service. Unlike PayPal but similarly to other companies FastSpring provides an integrated solution by combining shopping cart functionality with accepting payment from customers and distributing it to the sellers. You define products that you want to sell, their pricing (including prices in multiple currencies) and offers, like cross-sales, coupon or quantity discounts. You can choose several “flows” for the shop’s behaviour (separate payment information to another page or not, for example). The store can be edited and tested at any time in a convenient test mode, leaving your live store functional until you’re ready to make the changes active. FastSpring fits well small software companies that want to sell their software, like us. They provide a highly customizable notification engine to add customers to your own database. Similar to PayPal’s IPN but more customizable. FastSpring can also call your server to retrieve licenses for the purchased products and then display and email these to customer with the template that you choose yourself. This part of their backend really shines for control freaks like some of us are. There’s a reporting section in the backend. You can see there the sales history and also tables and charts to show sales by country, by promotion, by product, by days and some more options. I would prefer some more deep analysis options, like seeing specific product sales by country. Yet, it might just appear in the next release. UPDATE: This is possible to do as well, I just didn’t find how to do it. Got an email from them that explains how to do it. All the sales data can be conveniently downloaded in CSV format. This can be handy if you want to do some deeper analysis on the data in a spreadsheet or for accounting purposes. During our first couple of weeks I’ve found several minor bugs in Springboard and they were all fixed in the next release. In fact, they seem to be working like an agile development shop, releasing a version of it at least once a month. 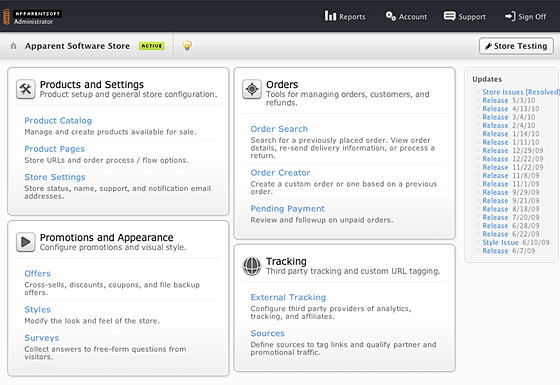 The releases add new features to the store management, UI improvements or bug fixes. All promptly displayed in release notes. There are some more advanced capabilities in the store’s backend, like the ability to split the income between several accounts which is good for bundles or for major affiliates. We’re currently preparing the infrastructure for MacGraPhoto 2 bundle and we’ve verified all the important issues with their customer support first, to find a solution that would work well for us. In fact, the recent MacBuzzer software bundle used FastSpring for the sales. FastSpring accepts the regular payment options such as credit cards and PayPal but they also allow to receive Purchase Orders and you have some control about how to work with them. This might be important if some of your customers are governmental institutions or other companies that use POs. FastSpring itself pays you twice a month (or monthly if you prefer). They can transfer the money either to your PayPal account, by wire or by check. Like in other companies, you can also set a minimum amount to be transferred, if your sales are low and transfer fees are high. In the past 6 months I’ve seen several fellow Mac and non-Mac developers who moved to FastSpring or added them as an additional option to their current payment provider and I’ve only heard good feedback. Personally, we’re extremely content with the combination of extraordinary customers service, the desire to please the seller and the constant improvements to the already powerful but comfortable store backend.